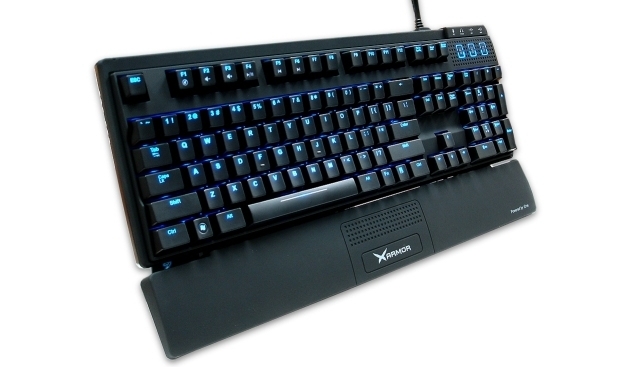 The iOne Xarmor U9BL-S follows suit with other “silent” versions of popular keyboards like the Das Keyboard Model S Professional Silent. When companies use the word silent, they typically mean that the keyboard uses Cherry MX Brown key-switches. This means that the keys will have a tactile feel with a softer click, for those that don’t like the noise the Cherry MX Blues make, or simply need to be considerate of noise-sensitive co-workers, sleepers, etc. The build quality is similar to the original U9BL, and it has the same good looking blue backlighting with 4 levels of illumination. There’s a 2-port USB 2.0 hub, headphone jack, and microphone jack, and a detachable wrist pad. The top, sides, and the wrist pad are all covered in a rubberized matte material. The keys have a softer sound, but feel great. The package includes a PS/2-to-USB adapter, a keycap puller, and additional orange key-caps for the WASD gaming cluster, so you’re hands will never forget their placement. In the end, the choice between the U9BL and the U9BL-S is easy depending on your situation. If you’re looking to control the noise of the keyboard, or simply don’t like all the clickity clacks, go for the U9BL-S because you aren’t giving up any of the great features. If you do enjoy the noise, and consider it music to your ears, grab the U9BL and you won’t be disappointed.